memory proved to be remarkably accurate! organist and cellist and spent ten years as a chorister at Wells Cathedral. the Life of Me”. Perhaps you could be of help here. 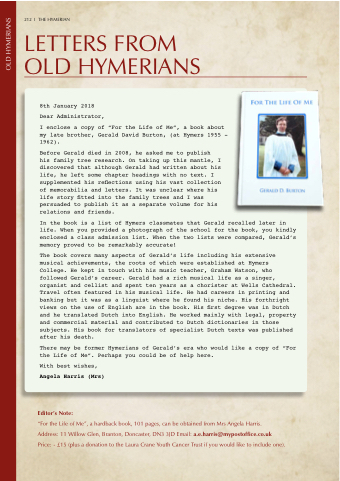 “For the Life of Me”, a hardback book, 101 pages, can be obtained from Mrs Angela Harris. Address: 11 Willow Glen, Branton, Doncaster, DN3 3JD Email: a.e.harris@mypostoffice.co.uk Price: - £15 (plus a donation to the Laura Crane Youth Cancer Trust if you would like to include one).